It’s not like my family consisted of Thanksgiving gourmets or anything. We weren’t a fancy people. The crescent rolls came from Pillsbury, the pies sometimes from Bakers Square, the gravy base from a packet. But there were some things my parents (mainly my mother) would never have dreamed of compromising on: the stuffing, for example, and the cranberries. The wobbly crimson substance added nothing to my Thanksgiving enjoyment, unlike my mother’s lemon-zested, multi-spiced version. There was no delightful pop of berry augmenting my perfect turkey-stuffing-cranberry forkful. And here’s the part that drives me especially crazy about canned cranberry sauce: Making your own cranberry sauce from scratch is so easy! Even the recipe on the fresh berry bag is just cranberries, water, and sugar. My mom liked to zest it up with orange juice, citrus rind, vanilla, and a cinnamon stick or two. Cranberries become a canvas for you to decorate with seasoning, whether you favor orange or lemon zest, cinnamon or nutmeg, brown sugar or white, ginger or cloves. We used to add apples sometimes. The point is, you can experiment. Go crazy. 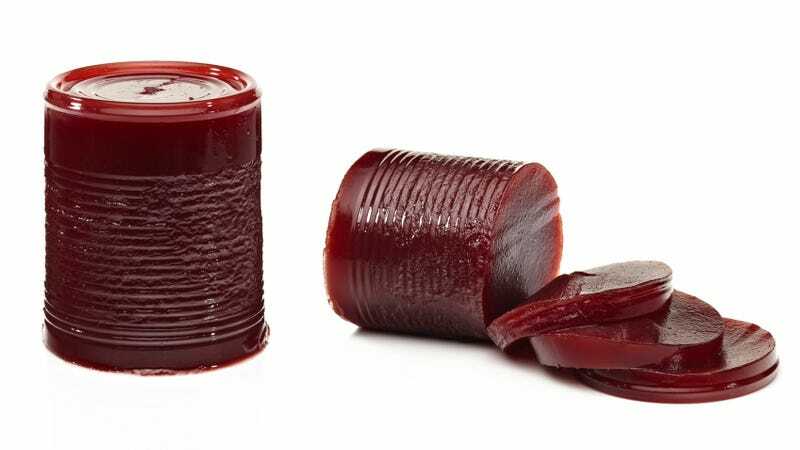 If you are dumping cranberry sauce out of a can onto a table, what are your options? Horizontal or vertical. Sliced or no. You can try to add a spring of something green for garnish, but you won’t be fooling anyone. If you’ve never made homemade cranberry sauce, I urge you to try this recipe out this year and I suspect you’ll become an instant convert—easier than pie, and it makes your kitchen smell amazing. And it’s almost as simple as opening a can, making store-bought canberry sauce absolutely irrelevant. Dissolve sugar into water over medium heat in saucepan. When it begins to boil, dump in cranberries. When that begins to boil, add spices and let cook at a slightly lower heat for about 10 minutes, when the cranberries begin to pop (in and of itself a heavenly experience). Cool, top with zest and serve.